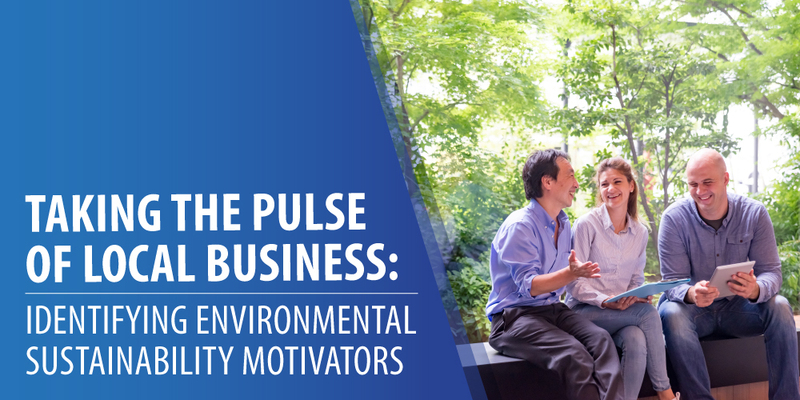 In order to best help our current and future clients, it is important for us to understand what motivates and challenges businesses when it comes to issues of environmental sustainability. To acquire our desired insight, we reached out to approximately 188 businesses in the Guelph-Wellington area between May and October 2018. We initially contacted businesses by phone to introduce them to the initiative. We gathered data from 32 businesses who completed an online survey representing a 17 per cent response rate. Participants ranged from startups to businesses with over $5 million in revenue. While the sample size was relatively small, participant responses do illuminate the potential for interesting and innovative sustainability-focused opportunities within Guelph-Wellington. When provided with a list of environmental sustainability actions, larger businesses were more likely to have implemented them. Not surprising since many actions specified involve formal structures that smaller businesses may not yet have the capacity to develop. Notably, 72 per cent of responding businesses have implemented measures to mitigate waste, heating and cooling, electricity, and/or water. Although respondents identified a range of motivations for implementing sustainability initiatives, this last data point supports cost-savings as one key motivator. A future post in this series will examine the barriers to taking environmental sustainability actions and identify supports that businesses would find useful in transitioning to a more sustainable future. In addition, to better understand environmental sustainability in smaller businesses, a series of more applicable questions could be developed.